It’s so common these days to read blog posts, and books or see motivational quotes designed to help the working mom or the workout mom achieve her #goals. For some stay at home moms those personal goals that once were get put on hold in order to focus on creating a home and raising a family. This whirlwind of stay at home parenting deserves just as much intention and goal setting as out of the house work, maybe even more so. I’m not downplaying the huge responsibilities of working parents, because they bust their butts and deserve credit for that. They also have a boss (most likely,) a schedule and coworkers that hold them accountable for getting stuff done. I’m going to be honest, some days, when there was no one or no thing to hold me accountable, I just turned into a hot mess with no direction. Those were the days I was more likely to snap, let the house chores implode and wind up falling into a depression. This is why it is hugely important to set clear goals or intentions for what you want to accomplish in a day, week, month and maybe for the year. In fact, Abby with Just a Girl and Her Blog has a great organizational planner for things like this that also help you plan groceries, workouts and basically, life. Read to kids for 20 minutes. Read alone for 20 minutes. Stop working at 6pm —this one is crucial. Make a big arts and craft mess (at least) one day. Mini field trip one day. Go on a kid-free date night! Remind yourself what you want to accomplish and it will make it a lot easier on those days when you feel absolutely defeated and getting out of bed feels harsh enough. Holy moly, I can’t explain enough how much I wish groceries had been more easily available when my kids were younger! Today they have places like $5 Meal Plan that create healthy meal plans for you! Even better than that, there are a wide variety of options to buy online and save yourself the time and hassle of dragging your kiddos through the energy sucking process of buying food. –Can you tell I’m a fan? Take the time to visit some of these great options that bring groceries right to your front door! KidStir – Ok, KidStir is more for your kids than for you. But they definitely take all the guess work out of helping your kids get started with baking in the kitchen. FreshDirect – FreshDirect delivers fresh foods right to your door. The Green Life – Everything you want for you, your baby, pets, cleaning supplies and more. Thrive Market – Thrive Market is widely known as one of the best online sources for high quality, healthy foods. UrthBox – Choose monthly snack and beverage boxes based off your diet and health needs. Love with Food – Love with Food is a great monthly subscription company for your kiddos. UberEATS – Did you know Uber will deliver food right to your door from your favorite restaurants? News flash: you are not Superwoman. No one is. Do not set goals for yourself that are unattainable. Of course there is nothing wrong with aiming to be better, but don’t set too much too fast because chances are you will come out feeling like a failure. If you can’t bake cookies for the PTA, homemake all organic baby food, completely breast feed for a year, do your makeup every day, give your husband a back rub, keep the house spotless and maintain 10 friendships then don’t even try! If you can keep the house semi presentable, kids alive and put on jeans once a week and feel successful, then just stick with that. As soon as you set too big of goals for yourself, it’s easy to feel instantly overwhelmed. Save yourself this inner battle and just don’t do it. Yeah, there’s that saying out there that says, “You have the same number of hours in a day as Beyonce.” I’d like to add to that that you don’t have the same amount of personal assistants, chefs, makeup artists, trainers, etc. as she does. I know I sure don’t, otherwise I wouldn’t be doing at home facials and making my own homemade concoctions. Yes, you have 24 hours in a day, but you are not supposed to be active for all of them! Some days you will be a superstar and other days you will barely open your eyes and your coffee will be warmed up 8 times. The one thing with this is just accepting that you don’t have all day. Make sure you get rest. Sleep when the baby does and if you turn on a mindless cartoon in hopes of snoozing for 15 minutes on the couch because you can barely keep your eyes open, nobody is judging you. If they are, it’s probably just because they don’t want to face their own insecurities about failure. So many moms tend to spend a good portion of their time worrying about that extra baby weight. It can be really mentally draining when you spend all day on your feet (or sitting and feeding) and at the end of the day you feel like you didn’t drop a pound. Trust me, I get it. After having my second baby, dropping those last 10 pounds started to feel impossible. I’m here to tell you, don’t fret, Mama. Your body is recovering, and has been through a lot. Don’t let the appearance of your body be your main focus. I know some of you are going, “Honey, it’s been 8 years since I had a newborn…I still have that baby weight!” If that’s the case there are so many small ways to start getting yourself on the right track again. If food is your biggest struggle, I highly recommend you check out The Food Fix. The Food Fix is a variety of meal plans and coaching options designed by renowned nutritionist, Heather Bauer to help you get on the right track without fad diets or starving yourself. You can also visit my post about all my favorite at home workouts. When I made the choice to be a stay at home mom, I knew there was going to be some financial sacrifice. Life would no doubt be tougher working with only one income. I knew I didn’t want to work only to end up giving it right back to a daycare. Money is just going to be tight. Oh well. Let’s head to Baby Gap, their clothes are soooo cute. I don’t want money to be a burden. My kids can wear hand-me downs, they’ll just grow out of them anyway. We have been planning, saving and preparing so that we can financially get through this with less stress. I’m not being judgemental, but rather basing these off my 3 different mindsets that I personally had while being a stay at home mom. Money being tight was always in the back of my mind. I knew it was going to be challenging so when we were living paycheck to paycheck I just told myself this was how it was going to be. I didn’t do anything to change it, didn’t think to start a budget or even stop my unnecessary shopping sprees. I felt I deserved new things for myself since I spent so much time doing things for everyone else. While this “treat yourself” mentality definitely isn’t wrong, I sure went about it the wrong way. My kids still wore hand-me-downs and second hand outfits, but I also never missed an opportunity to shop the Target racks either! If you’re all about shopping second hand for your kids, take a moment to visit Bagsy, a great online source for adorable and gently used kid clothing or Swap.com the largest online thrift store. IGrad – This is literally a college course style financial lesson with a flipped classroom approach. Love and Money – Brightpeak Financial has a great course called Love and Money that teaches couples how to work together when it comes to finances and budgeting. A more beneficial way to look at this situation (versus my first mindset) is to know money is going to be tight, therefore spend wisely, be smart and stick to a budget. If you have never created a budget before, I have a very easy to follow one laid out in my Fun Sized Budget Bundle. When I started realizing money was “tight” and we didn’t like living paycheck to paycheck, I started my own photography business and also did a few direct sales jobs in order to make additional income. If you know me by now, you know I didn’t make any smart choices with this income. Not a chance. We just used these jobs as another way to blow money on more things. Don’t be me. Be smarter than me. Be the mom that plans coupons wisely, is smart with part time income and stretches her dollar as best she can. Check out my personal favorite rebate apps to use when shopping. There is nothing to lose by telling your money where to go rather than giving it no purpose at all. Maybe you know you wanted to be a stay at home mom long before you even had children. The best possible way to prepare for this is to…prepare for it! Save your money in advance, find the areas where you’re going to need a little extra cushion. Build a savings and continue to live on a budget. Don’t forget to check out the financial help recommendations I laid out above! Save, save, save, save! Building a good savings will help you huge through surviving the financial setbacks of living off one income, but don’t underestimate your debts either! Getting your debts paid off as much as possible before being a stay at home parent can end up creating an additional income in itself! For the first few years of mother hood getting out of the house meant walking around Target talking to my 4 month old…like a lunatic. No wonder Target wound up getting most of my money at the end of every month! Unfortunately, most of my friends were still living the single life, so I felt pretty isolated. I joined mommy and me classes but to be honest, they weren’t really my cup of tea. Small talk for me is basically like sucking the life out of me in a very slow and emotionally exhausting way. This is how I tend to turn people off too quickly, because I don’t waste any time immediately talking about my deep down, personal issues. Despite my not-so-fondness of forced interaction with others, I did manage to gain some friends (thanks to Facebook haha.) Those moms have proved to be irreplaceable in my life. They have known me and my kids since the beginning. They have helped me financially, emotionally and one even wound up being my neighbor for a few months! In fact, she has a blog dedicated to helping women survive Postpartum Depression and OCD. If this is an area you may be struggling in, head to her site, Delicate Change. Of course, depending on everyone’s different needs and personalities, these different things will look different for everyone. Getting your nails done might not be doable if you don’t have a sitter but you might get to the point where you can get your nails done side by side with your kiddos! Ultimately, do what you can to get yourself out and about. Get fresh air, adult contact and a little R&R whenever you are able to. I know I threw out some great monthly recommendations for you and your kids, but I don’t want to forget one that is just for mamas! Vinebox will send you wine each month based on your specific tastes. The best part is, they send you 3-6 each month so you can do some serious sampling. This is a great idea for a girl’s night in with some fellow mom survivors! The biggest thing that helped me both mentally and financially was when I would find or create a job for myself. I have always been an independent person and I enjoy the feeling of working. The repetitive things like dishes, cleaning and sweeping tend to make me a little bit crazy after a while. When it comes to work, I love fast paced environments, challenges and the feeling of earning money. The first time I got a job outside of being a SAHM it was because I needed something besides motherhood. I know that might sound foreign to some people but I think I have always known I needed a little more than just being a mother and nurturer to feel complete and satisfied. There is nothing wrong with this. Everyone is wired differently. I don’t love my children any less. To be the best mom I can to them, I need to have something for me. It makes me happier, gives me more energy, and makes my time with them that much more precious. The best part is, I have always managed to find part time work that fits perfectly with what we’ve needed at the time. Two hours in the morning, 2 hours in the evening, 5 hours 2 days a week or just work from home jobs. Getting a part time job can help mentally, for sure, but if your family is truly struggling financially, find where you might be capable of helping out. I know how helpless it can feel when you don’t bring any money in and the bills keep coming. I just want to let you know that it is totally possible to work around schedules and still ensure your kids are spending their time at home. If you and your family are in a financial tough spot, please use my Fun Sized Budget Bundle to access some great, easy to use tools to help you really see where your money is going. Re-evaluate your budget when needed, and get right with your finances so you can live the life you want. There is also a great printout to help you brainstorm extra income ideas! Although I have loved working part time at my multiple jobs, the best work (for me) was when it was all mine. The first time I realized this was when I was hired to work the beverage cart at a golf course. I was told what to do and then spent all day doing it. The harder I worked, the more money I earned. I loved it and I thrived on it. I would put in 10 hour days because of it. The constant sunshine didn’t hurt either! When I was doing direct sales I was completely in charge of what I earned. Connecting with people was something I wanted to do more because I felt ownership over what I was doing. I also believed in the products I sold, so I was a very convincing salesperson. Recommending things I love has always come natural to me. However, when it comes to looking into direct sales jobs, don’t do them just for the money because often times you’ll come up empty handed. If you don’t truly love and believe in a product you are selling, don’t sell it. After creating my own photography business I realized just how good I was at working for myself, although I didn’t like the accumulation that came along with photography (props and such). Then I found blogging! A job that requires no clutter, but I can make my own schedule and I am directly responsible for any money I bring in. Learn how I bring in money here. Blogging has also allowed me the freedom to teach my kids from home around our own schedule. We can travel, we can take Friday’s off and I can stay in my pajamas all day if I want to! No matter what, it’s important to find a job that is suited to you and your unique personality. One book helped me get those answers, I highly recommend it if you feel totally lost when it comes to who you are and what you’re suited for. Transcription – This is what my mother did as a work from home job all my life. Sometimes she was in an office and sometimes she was at home. Now transcribing is more and more common for people to do from home and can actually pay significant amounts of money! Get training. Freelance writer – More and more websites and online publications are willing to pay cash for your articles and input! It’s a great way to use your writing skills and make some extra cash! Use Writers Work LLC to find jobs and get paid. Flip old items – THIS is definitely one I could get on board with. Buying old broken down items and fixing them up to look brand new is a great way to make some extra cash from home! Check out a dresser I recently flipped. This is the most important lesson to learn when it comes to at-home parenting. Just let it go. This time is short and it really is precious. Some days you will have to let go of the little things like dirty laundry, messy hair and all organic. If you spend too much time fussing over the details, you might miss out on those really big moments that never come back again. If you are trying, if you love your kids and if you give each day your all; then you are doing a great job. Don’t ever trick yourself into believing you’re not. Be flexible, find what works for you and your family and try to soak up all the best parts. This post is so jammed packed with resources! I have left my job last April and we are still learning to be “comfortable” on one income (until my blog takes off). It’s not easy to run a household of 6, and requires a lot of organization. I too have days of depression where I can’t get off the couch to do anything. Thanks for taking the time to compile all this information. It’s good to feel I’m not the only one struggling. So glad you enjoyed it! I did NOT intend on it being so jam packed. But there’s really a lot to say! I am so impressed by this post! It’s totally packed with helpful info. 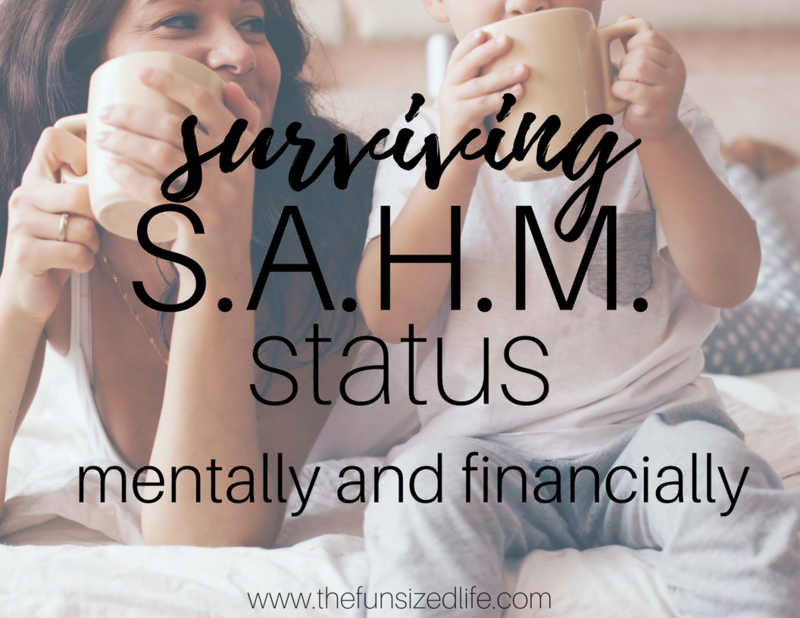 I always wanted to be a SAHM, but it’s definitely harder than I ever imagined it would be (and more rewarding too!). Having a few hours of “me time” once a week to get out of the house has been a lifesaver! Pinning! Thanks Maegan. YES! You absolutely have to carve time for yourself! It is not an easy thing! Great tips! I know some SAHMs who feel guilty getting me time, but you need what you need to be the best mom you can be. Yeah, I definitely struggled/struggle with the me time thing but now I see it’s really helpful for everyone…funny how I still can’t just do it for me. Haha.